With winter coming, people with pickup trucks are doing everything they can to winterize them to make sure they’ll run well. One thing people need to do is put snow tires on their pickups. One popular option is the Michelin Latitude X-Ice Xi2. 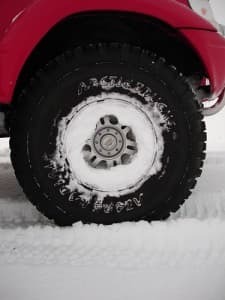 These tires have a silica-based rubber tread for the winter, which makes them firm and more stable in warmer weather, and flexible in colder weather, thus improving traction. There are also un-studded tires, so they’re legal in every state. They also have a directional tread design that’s meant to keep slush and ice out of the tire, increasing hydroplane resistance and giving drivers a safer drive. Their internal works include twin steel belts with polyamide cord that improves the tire’s performance at high speeds. There are also snow platform indicators in the tread grooves that tell the driver when traction is decreased due to wear. Another studless option to consider is the Dunlop Grandtrek SJ5. These tires have zig-zag grooves that enhance your pickup’s acceleration in snowy conditions, while the tread blocks can get you through uneven terrain. These tires also use Dunlop’s glass fiber-reinforces compound and mold it into a directional tread, meaning that these tires are both stable and will have the traction a driver will need. Like all the tires being shown, these ones carry the mountain and snowflake symbol that signifies they’re among the best winter tires available. Another option for those that either need studs, or can’t use studs, is the Firestone Winterforce UV tire. These share the same designs as earlier Winterforce tires, meaning that they can be mixed and matched if that’s what you need. The tread blocks not only have high-density siping to give them a grip in loose powder, but they can also be studded to increase traction in the most severe conditions. This tire’s internal structure includes twin steel belts upon a polyester casing, ensuring they’re not only strong, but that they will maintain a higher ride quality. Truck owners should keep in mind that not all states allow studded tires, and should review the laws in their area before purchasing them.